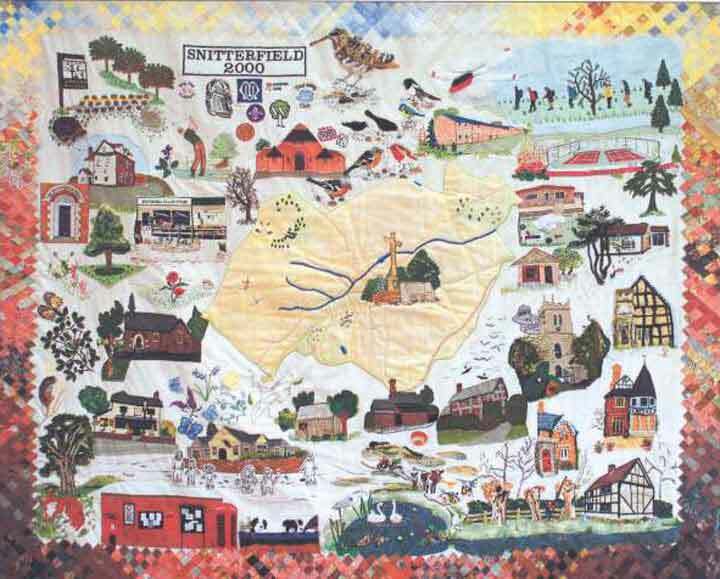 Early in 1999, Jean Dronsfield had a vision to create a wall hanging depicting a snapshot of Snitterfield at the start of the new millennium. She approached four likeminded ladies, June Thorne, Chris Chatland, Audrey Parnham and Shelagh Lucas, and the five of them met to work out a strategy on what to include on the hanging, which all hoped would become an heirloom for future generations.Unfortunately, Sheilagh had to leave the project due to ever increasing business commitments, but her initial input proved invaluable. The first hurdle was financing the project. With help and guidance from Fiona Clayton, Rural Arts Fieldworker with Stratford District Council, grants were forthcoming from Snitterfield Parish Council, Snitterfield Village Hall Committee, Stratford on Avon District Council, and the lottery funded 'Awards for all', and along with money raised by a garden party at Jean's home, funds totalling £2000 were realised, sufficient to make the project viable. A plea to the village community for unwanted items of fabric materials, embroidery silks and wools produced an overwhelming response, so much so that many villagers will recognise their own contributions in the many different features within the finished article. Now that the money and ideas were in place, the second hurdle was how to proceed and it was agreed to seek the assistance of Fiona Clayton, who recommended the professional services of Anne Brown. In November 1999, the first working party was called and with Anne Brown's guidance, the project began in earnest. Contributions in some form or another from some 30 ladies in the village, representing many hours of love, sweat, toil, and some tears over a period of some three years, brought about a basic work of appliqué on calico with many embroidery stitches in silks and wools. In the latter stages, Jean, June and Chris spent many hours on the floor of June's residence piecing together and adding the finishing touches to what they knew was developing into a beautiful work of art. The final hurdle was to determine a resting place for the wall hanging where all could see and marvel. With the village hall due for redecoration, it was agreed with the kind permission of the Parochial Church Council that a temporary home would be found in the Parish Church, St. James the Great, where after an official opening in the Village Hall on 2nd November 2002, it can be viewed in all its splendour. Amy Worden, with the guidance of Anne Brown.